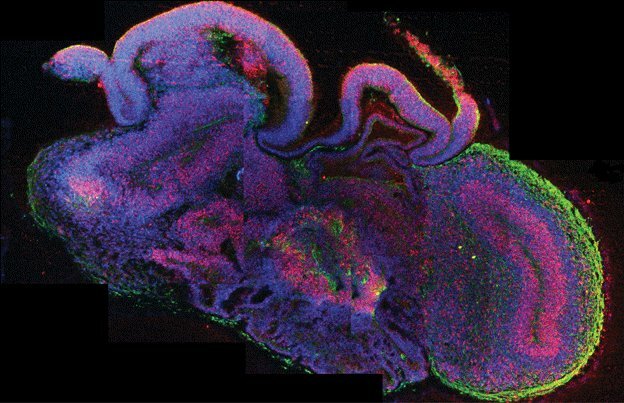 Miniature “human brains” have been grown in a lab in a feat scientists hope will transform the understanding of neurological disorders. Scientists at Institute of Molecular Biotechnology of the Austrian Academy of Sciences have now reproduced some of the earliest stages of the organ’s development in the laboratory. They used either embryonic stem cells or adult skin cells to produce the part of an embryo that develops into the brain and spinal cord – the neuroectoderm. This was placed in tiny droplets of gel to give a scaffold for the tissue to grow and was placed into a spinning bioreactor, a nutrient bath that supplies nutrients and oxygen. The cells were able to grow and organise themselves into separate regions of the brain, such as the cerebral cortex, the retina, and, rarely, an early hippocampus, which would be heavily involved in memory in a fully developed adult brain. The researchers are confident that this closely, but far from perfectly, matches brain development in a foetus until the nine week stage. The tissues reached their maximum size, about 4mm (0.1in), after two months. The “mini-brains” have survived for nearly a year, but did not grow any larger. There is no blood supply, just brain tissue, so nutrients and oxygen cannot penetrate into the middle of the brain-like structure. One of the researchers, Dr Juergen Knoblich, said: “What our organoids are good for is to model development of the brain and to study anything that causes a defect in development. The technique could also be used to replace mice and rats in drug research as new treatments could be tested on actual brain tissue. To read the full article, click the link. About a hundred Swiss banks will avoid prosecution by divulging the names of US clients who have allegedly avoided tax by using secret accounts. The banks could face fines of up to 50 percent of the asset value if they provide full disclosure. The settlement will apply to second-tier Swiss banks and will be open to banks not already under a US criminal investigation. 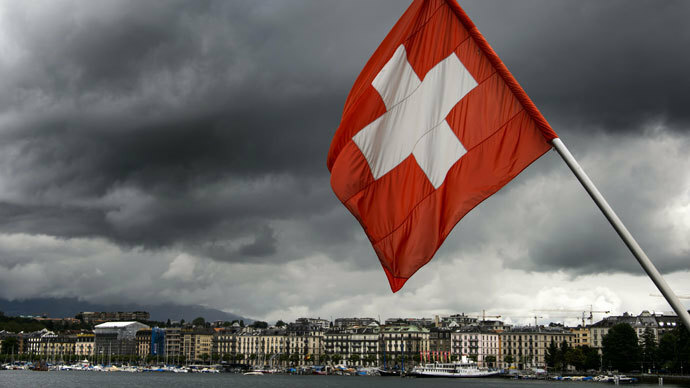 This rules out the second-largest Swiss bank, Credit Suisse; the largest European bank HSBC Holdings Plc and Julius Baer Group Ltd, as well as several regional banks. Under the deal, each bank will set its own non-prosecution or deferred-prosecution agreement with the US authorities. “The program is intended to enable every Swiss bank that is not already under criminal investigation to find a path to resolution,” the US Department of Justice said in a statement. The fines are set to reach up to 50 percent of the aggregate value of any undeclared accounts held by wealthy Americans, depending on the time the accounts were opened. To decide whether they can afford paying billions of dollars in fines and participate in the deal, Swiss banks will have to assess the cost of potential penalties versus the risk of US prosecution. “It’s a choice between two evils,” a tax lawyer with Poledna Boss Kurer AG in Zurich, Walter Boss, told Reuters. If they don’t cooperate with the US, the US might indict them,” he stated. It’s hoped the breakthrough agreement with the world’s largest off-shore financial center with about $2.2 trillion of assets will boost the US campaign against tax evasion by citizens hiding their funds abroad. It means, Switzerland will finally cease to be a “secret banking heaven” for Americans out of reach of US tax authorities. “This program will significantly enhance the Justice Department’s ongoing efforts to aggressively pursue those who attempt to evade the law by hiding their assets outside of the United States,” US Attorney General Eric Holder said in a statement. “In addition to strengthening our partnership with the Swiss government, the program’s requirement that Swiss banks provide detailed account information will improve our ability to bring tax dollars back to the US Treasury from across the globe,” he added. Southern California’s Glendale Unified School District has hired an outside company to spy on their students’ Facebook, Twitter, Instagram and YouTube activities, going truly above and beyond in the name of student safety. While it’s hardly surprising to see public schools invading the privacy of their students, be it through iris scanning or forcing students to wear RFID-enabled identification cards, this is truly unusual. Richard Sheehan, the superintendent of the Glendale district, told CBS Los Angeles that a Hermosa Beach, California company called Geo Listening is busy analyzing the online posts of some 13,000 students across eight middle and high schools in his district. The system is reportedly aimed at giving information that school administrators consider critical to their personnel as quickly as possible. To read the full article, click the link above…..
Would you willingly send your kids into a war zone? No way. Would you willingly send your children into a federal prison? Of course not. So why would you send them to a public school? In America today, kids are being killed on the way to school, at school and on the way home from school. Mass shootings are becoming increasingly common, the influence of gangs in our schools is on the rise and sometimes the biggest threat of danger comes from the teachers and the security officials that are supposed to be there to “protect” our children. But violence is not the only thing for parents to be concerned about when it comes to our public schools. The truth is that public schools in the United States have become government indoctrination centers, and many teachers are constantly looking for opportunities to inject as much propaganda as they possibly can into classroom instruction. After a dozen years of this, many students leave high school virtually brainwashed and nearly incapable of thinking for themselves. This is one of the reasons why so many high school students seem like they are dumb as a rock. Our young people spend most of their young lives in prison camps where they are constantly being told what to think instead of being trained how to think. Why would anyone want to subject their children to that? When it comes to their children, safety is the number one priority for most parents. They expect that their children will be kept safe going to school, while they are at school, and coming home from school. Unfortunately, school is becoming an increasingly dangerous place to be for our children. And I am not just talking about the mass shootings that have happened in recent years. A non-profit organization says North Carolina police threatened to arrest members of the charity group for distributing food to more than 70 homeless people in downtown Raleigh on Saturday morning. Love Wins Ministries, a church group that tries to care for the city’s homeless, was preparing to serve breakfast on Saturday. The group had free coffee and sausage biscuits for more than 70 homeless people, but local police stopped the non-profit from handing it out. Police officers threatened to arrest anyone who tried to distribute food, claiming it violates one of the city’s ordinances but refusing to say which one. Since 1998, Sec. 9-2022 of the rules governing city parks prohibits the distribution of food without a permit, but the non-profit claims its efforts were never previously halted. Hollowell was disturbed at the fact that police refused to name the ordinance that prohibits public food distribution, thereby keeping the group in the dark about what they were doing wrong. Hollowell told WRAL-TV that the police work for the mayor and the City Council, who oversee responsibility for the revitalization of downtown Raleigh. Even though his group cleans up the mess after serving meals, he believes the city perceives his efforts as a challenge to the revitalization effort. 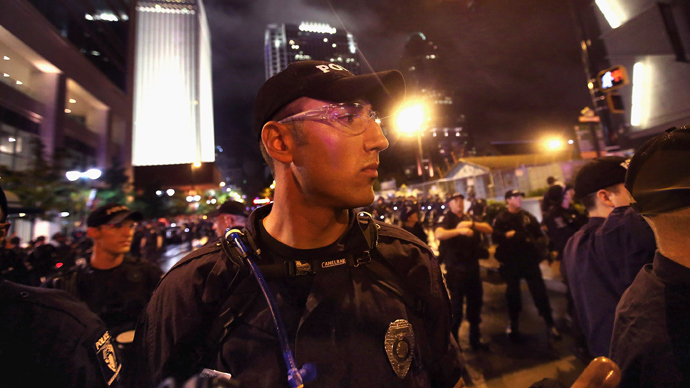 Police spokesman Jim Sughrue told WRAL that no one was arrested on Saturday and members of the group were “simply informed” about the rules. But Love Wins is not the only non-profit organization whose efforts to help the homeless were brought to an abrupt halt: another group, Human Beans Together, has already been notified that its members could no longer help the homeless on public grounds. In response, Human Beans moved its operations to a private parking lot, but police also asked them to leave that area on Sunday. “We had lots of volunteers and lots of hungry people and nowhere to go,” said volunteer Todd Pratt. Mayor Nancy McFarlane and City Council member Mary-Ann Baldwin on Sunday pledged to address the matter this week and try to come up with a solution that will both keep the city clean and allow the non-profits to continue helping the homeless. 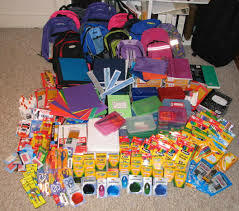 In Fort Wayne, Indiana, the County Department of Health is ‘helping’ kids get back to school by offering free school supplies to those who consent to vaccinations. For some free crayons and construction paper, many parents are unknowingly exposing their children to a very well-hushed fact that one of the most common vaccinations required of school aged children, the MMR vaccine, or measles, mumps and rubella immunization, has a potential link to multiple ailments – including autism. “Getting children all of the vaccines recommended by CDC’s immunization schedule is one of the most important things parents can do to protect their children’s health – and that of classmates and the community,” said Allen County Health Commissioner Dr. Deborah McMahan. Perhaps Dr. McMahan should check the latest research. While there is much controversy about the topic, evidence has been around for more than 10 years that MMR has been linked to the autism spectrum. In one study published in 2002, the vaccine was found to cause an immune reaction which is thought to play a great role in autism. Dr Vijendra Singh analyzed blood samples from 125 autistic children and 92 children who did not have the disorder. In 75 of the autistic children they found antibodies showing there had been an abnormal reaction to the measles component of the measles, mumps and rubella vaccine. Nine out of 10 of those children were also positive for antibodies thought to be involved in autism. These antibodies attack the brain by targeting the basic building blocks of myelin, the insulating sheath that covers nerve fibres. This stops the nerves developing properly and may affect brain functions. None of the non-autistic children showed the unusual anti-measles response. Dr Singh has suggested that an abnormal immune response [caused by MMR] may be the root cause of many cases of autism. There are numerous additional studies linking MMR vaccinations to autism, and some pointing to a change in gut bacteria which are also responsible for a child’s immunity. Andrew Wakefield’s research saying as much has been corroborated now by multiple studies. Yeah, we know it’s controversial.